Edited by Petr Šantavý . Aortic stenosis is a major health problem with large personal and economic impact. In the last decades there has been a trend of worldwide aging, and diseases which are common in elderly people will take an important place in clinical practice. Aortic stenosis affects 3-5 percent of persons older than 65 years and leads to greater morbidity and mortality than other cardiac valve diseases. Currently, aortic stenosis is the most frequent heart valve disease in industrialized countries and its prevalence increases with age. Thus with the prolongation of life expectancy, the population of patients with aortic stenosis is expected to grow in the future. The etiology of this disease is changing and is more precisely specified. Diagnostics is changing with new trends and technical developments in echocardiography. Guidelines and indications for aortic valve replacement are changing thanks to new trends in anesthesiology, surgery and mini-invasive approaches. Patients previously considered too old or ill are now indicated for aortic valve replacement procedures. The approach and management of isolated aortic valve stenosis between fetal life and late adolescence is discussed in the first chapter. 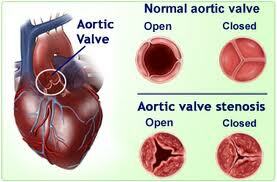 Bicuspid aortic valve as a most common form of congenital valve stenosis, is also described. Since approximately 2% of people over the age of 65, 3% of people over the age of 75, and 4% of people over the age of 85 have the disorder, important geriatric aspects of aortic stenosis are discussed in the second chapter. Highly accurate indications are extremely important in future treatment decisions. Abnormal left ventricular response to exercise and change in the hemodynamic severity of the valvular disease add to the prognostic value of clinical symptoms. Therefore stress testing is debated in the third chapter. Successful valve replacement surgery in elderly and often polymorbid patients with congestive heart failure would not be possible without properly aimed modern anesthesia and monitoring. Patients formerly considered inoperable are now profiting from valve replacement procedures. Challenges in anesthesia and post-surgical care are described in chapter four. The only mode of treatment of highly calcified degenerated native aortic valve is its replacement. In chapter five types of surgical approaches and valve prostheses are discussed. Currently, there is no artificial aortic valve prosthesis hemodynamically equal to native healthy aortic valve. The condition, where the prosthesis orifice is distinctly smaller for a given patient than natively appropriate is defined as patient-prosthesis mismatch. Clinical importance of this phenomenon is the subject of chapter six. Atrial fibrillation is the most common concurrent arrhythmia associated with heart valve diseases and is very poorly tolerated by patients. Sinus rhythm restitution contributes to hemodynamic heart output increase and clinical status improvement. Atrial fibrillation treatment modalities are debated in chapter seven. Despite increasing safeness of standard aortic valve replacement surgery, it is still greatly complex procedure connected with possible adverse complications especially in polymorbid elderly patients. Therefore an effort to decrease extensiveness of surgery has led to development of mini-invasive approaches and procedures. These principles and techniques, which are still evolving, are discussed in the final chapter. Limited volume of this book cannot substitute comprehensiveness of textbooks, but tries to depict current advances in aortic valve stenosis evaluation and treatment.